Palestinian amora of the first generation (3d cent. ); son of the famous R. Ḥiyya. In Midr. Shemuel xi., and in Yer. Sanh. 29b, he is called also Judah be-Rabbi. He was the twin brother of Hezekiah (Yeb. 65b) and son-in-law of Yannai, who outlived him (Ket. 62b). 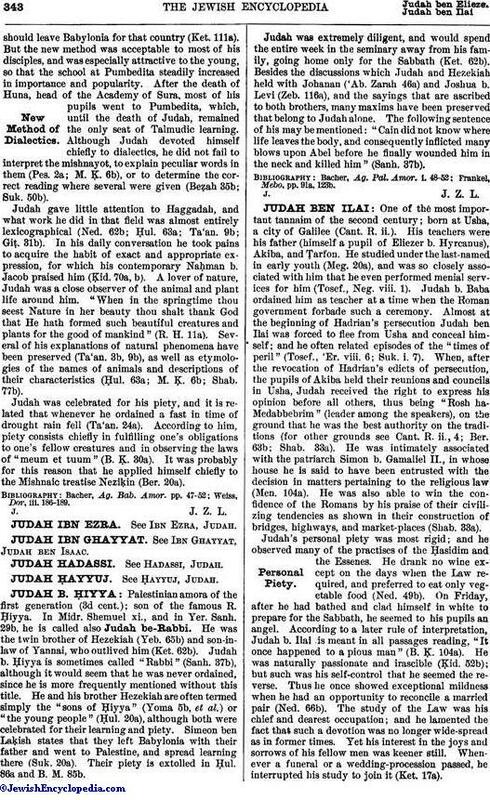 Judah b. Ḥiyya is sometimes called "Rabbi" (Sanh. 37b), although it would seem that he was never ordained, since he is more frequently mentioned without this title. He and his brother Hezekiah are often termed simply the "sons of Ḥiyya" (Yoma 5b, et al.) or "the young people" (Ḥul. 20a), although both were celebrated for their learning and piety. Simeon ben Laḳish states that they left Babylonia with their father and went to Palestine, and spread learning there (Suk. 20a). Their piety is extolled in Ḥul. 86a and B. M. 85b. Judah was extremely diligent, and would spend the entire week in the seminary away from his family, going home only for the Sabbath (Ket. 62b). Besides the discussions which Judah and Hezekiah held with Johanan ('Ab. Zarah 46a) and Joshua b. Levi (Zeb. 116a), and the sayings that are ascribed to both brothers, many maxims have been preserved that belong to Judah alone. The following sentence of his may be mentioned: "Cain did not know where life leaves the body, and consequently inflicted many blows upon Abel before he finally wounded him in the neck and killed him" (Sanh. 37b). Frankel, Mebo, pp. 91a, 123b.